On the heels of last week’s latest disappointing jobs numbers, today’s Job Openings and Labor Turnover Survey (JOLTS) report, unsurprisingly, shows little improvement in the labor market. In March, overall job openings rose slightly, while the number of people hired decreased. 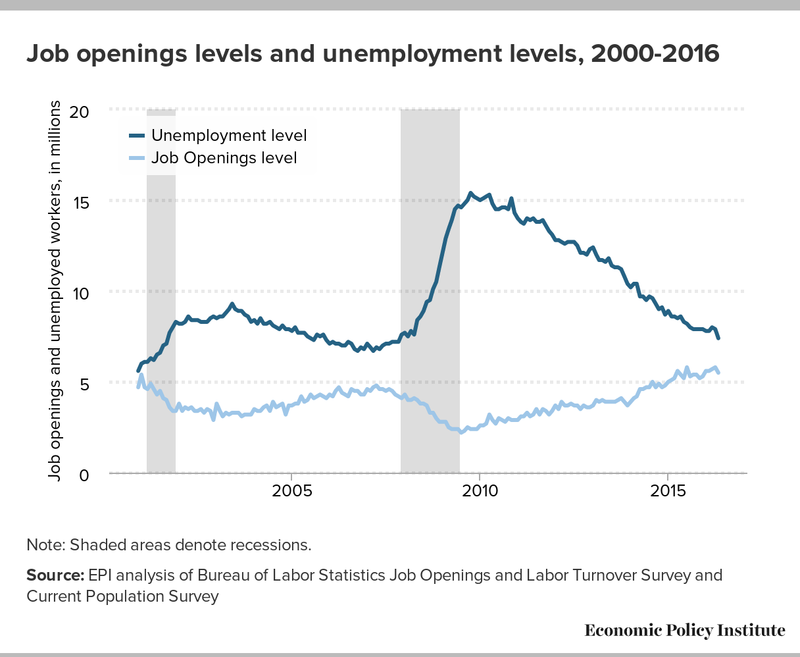 When we look at these numbers over the year, there has been a marked improvement in job openings—an increase in the rate of job openings (the number of job openings as a share of total employment plus job openings) from 3.5 to 3.9. Over that same period, the hires rate only increased from 3.6 to 3.7—a far slower improvement. 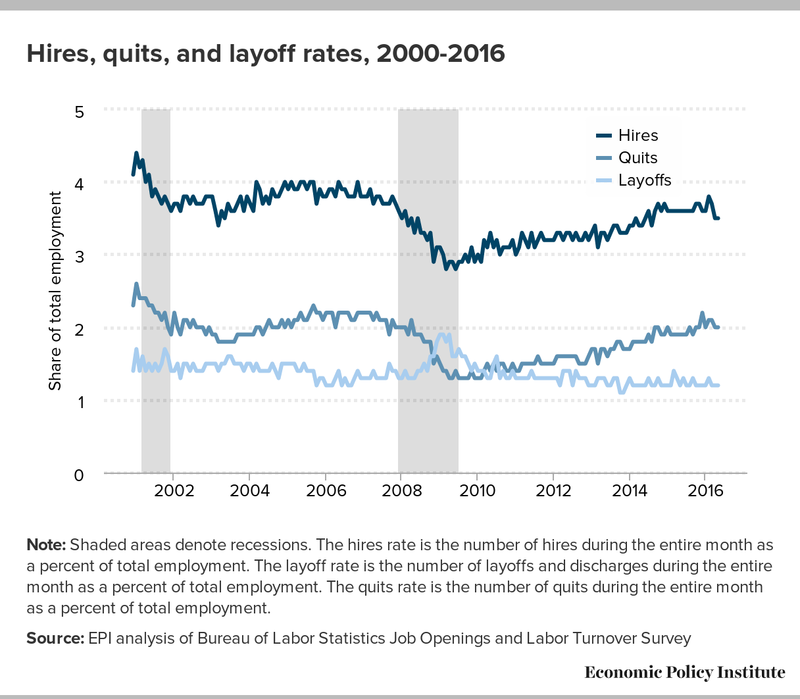 In today’s economy—as opposed to decades past—the listing of job openings is relatively easy and inexpensive, and may not accurately reflect an employer’s efforts to actually fill those openings. Employers may be interested in filling those positions at lower wages than would be required in a stronger labor market. They may not be searching intensively to find workers or willing to fill those positions if they have to offer higher wages. Considering the number of unemployed workers in the economy and the number of missing workers waiting on the sidelines for more opportunities, it seems that many of these openings could be filled if employers were more serious about filing them. It’s fairly straightforward economics at play here. If employers are unhappy with the pool of applicants, they simply might need to improve the job offering—the wages and benefits being offered—to recruit the candidates they desire. When that happens, we should see better wage growth than we’ve seen in the last several years of the recovery. If we look simply at the number of unemployed workers and the number of job openings in the economy, it is clear that there is still quite a distance to traverse before we get to the full employment economy of the late 1990s and 2000. In today’s economy, there are still 14 people for every 10 job openings. That means that no matter what four of those 14 people do, they will simply not be able to find employment. And, if those job openings don’t translate into actual hires, there are even fewer opportunities than that ratio would suggest. Aside from wage growth, the leading lagging indicator in my book is the employment-to-population ratio, particularly the prime-age employment-to-population ratio (EPOP). Last week, I noted just how far prime-age EPOPs had to go before reaching pre-recession levels. Until we see the hires rate pick-up, prime-age EPOPs will remain depressed and will never return to their full employment levels.